During late spring, summer and autumn the project has moved forward with registering the find material from the eastern trench. Due to vacations, conferences and other engagements we have not published any posts concerning our progress for a while. Wait no more! Here is a recapture of what we have been working with the last few months. We are happy to announce that several material categories from the eastern trench have been registered. Pottery and flint are both material categories that comprise a large number of objects; they are also two of the most thoroughly registered materials that we have worked with within the project. A lot of information has been registered for every post. Nonetheless, the registration of both pottery and flint have been completed. Other inorganic materials such as burned clay, daub, stone axes, strike-a-lights and pecking stones have also been registered recently. 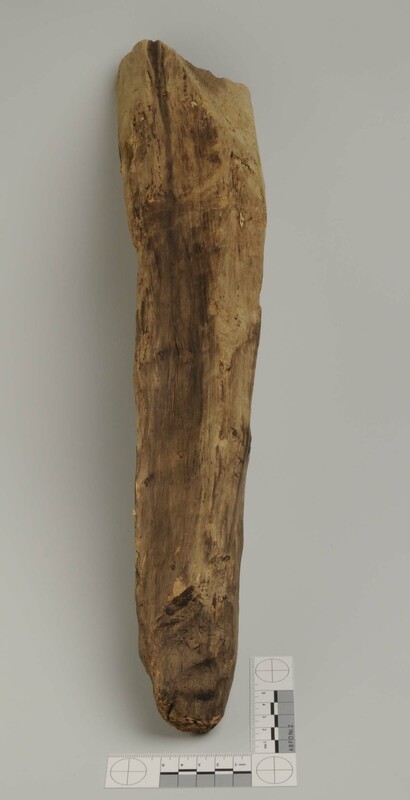 One of the poles from Alvastra pile dwelling (FID1211512). Photo: Nathalie Hinders SHMM. We have also worked with fantastic organic materials that have been found at the site. They have been preserved through the ages due to the oxygen-free environment of the mire. Bone artefacts, wooden artefacts and apples are good examples of perishable materials that have survived in the wetland. Bark, hazelnuts, poles, seeds and the odd shell have been documented as well. It has been an interesting and exciting time to work with these materials that we Stone Age archaeologists seldom see due to high age and degradation. One of the most spectacular bone artefacts that has been registered so far is this bone dagger. It has been made out of red deer. During time of use, at least before fragmentation and/or deposition, the dagger was partially subjected to fire or hot embers. This is why the dagger ranges from white to grey in some areas. The different colours display different stages of cremation in bone. One of the bone daggers from the pile dwelling (FID1209127). Photo: Nathalie Hinders SHMM. Among the wooden artefacts I would like to draw attention to this wonderful carved spoon, or part of a small wooden bowl. 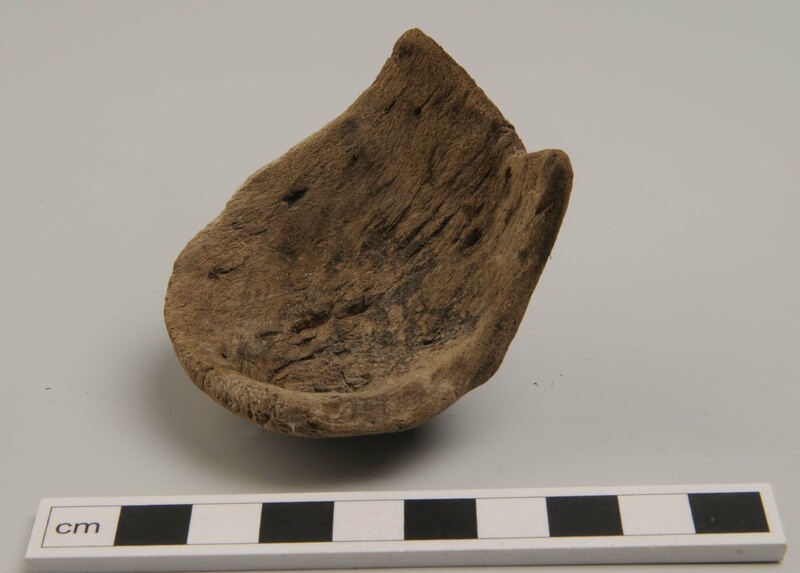 A small, carved wooden spoon or part of a wooden bowl (FID1211444). Photo: Nathalie Hinders SHMM. All in all, the project has registered more than 8000 objects so far. And the work goes on! We are currently working with so called non-constructive stone, polishing stones and a few artefacts that have been prevoiusly found in soil samples. We hope that we can go into more detail about the registered materials as soon as possible. Please note that all of our registered materials are readily availiable for you on our webpage through Sök i samlingarna. Technical aspects of registration mean that the total number of objects is somewhat complicated to calculate. Some material categories are represented by whole objects (i.e. flint and bone artefacts) and some categories are represented by fragments (pottery). Without detailed calculations of the database, the summary will only include objects that are registered in the database as antal, (number) and all the fragments of objects, registered in the database as fragment, are thus left out and the total number of registered objects seems to be lower than what it is.